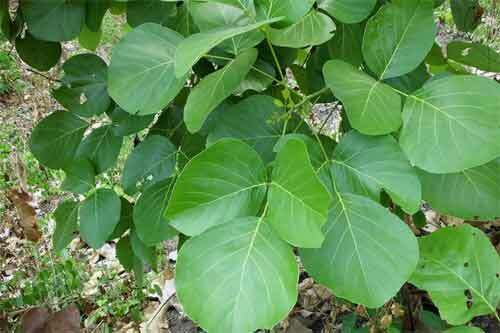 Palash means having sacred leaves and is an important tree in Hinduism. As per Hindu belief, the tree originated from the fallen feathers of a falcon soaked in Somarasa – the drink and offering made to Devas in Vedas. The religious significance of the tree starts with the trifoliate formation of the leaf – the middle part of the leaf represents Bhagwan Srihari Vishnu; Brahma on the left and Mahadev Shiva on the right. Palash Tree, in scriptures, is also referred to as treasurer of the gods. In some text it symbolizes the moon as the moon shining through the flowers is a spectacular sight. As per Hindu belief, the tree originated from the fallen feathers of a falcon soaked in Somarasa – the drink and offering made of Devas in Vedas. It is believed that once Gayatri in the form of eagle went to get somarasa from the celestial mountain Mujavana. While carrying back the somarasa, a guard of the mountain shot an arrow at the eagle, and a feather dipped in soma fell on earth. Palash tree grew from the feathers. As per another legend, Brahma was cursed by Goddess Parvati to become the palash tree. In Hindu yagnas, the twigs and wood are used for burning in havan. The leaves are used to pour ghee in havan. The wood of the tree used to make utensils for pujas and yagnas. Flowers are offered to Goddess Saraswati. During Upanayana ceremony, the young student who is initiated into the world of scriptures hold a staff made of palash wood. In some regions the blood red flowers of the Palash tree are offered to Goddess Kali. The flowers are offered instead of the blood of animals. There is a famous Marathi proverb related to palash tree - "Till the time the palash tree have leaves, don’t think of yourself as poor." During Holi festival, the flowers of palash dried and mixed with dal powders are used to make colors. In Ayurveda, the tree is referred to as Brahmavrksha. The tree and its flower have numerous medicinal properties. The flower of the palash tree is referred as Tesu. The palash tree needs little water and its leaves are used to make disposable plates. It is believed that eating on palash leaves is equal to eating on silver plates. The gum, flowers and leaves of the tree are commercially useful. The glue is used in making medicines and food items that provides strength. Boiling the flowers of the tree in water then bathing in it will help in curing skin diseases. The wood, fruit, root, flowers, leaves, and seed of the tree is used in preparing various medicines. The flower is crushed and mixed with milk and given to pregnant mothers. This will improve the strength of the mother and child. The powder of flower is used in medicine used to treat sexual disorders. Meitei community uses a portion of the palash tree trunk for cremation if the body of a drowned person is not recovered. In some regions, the trunk of tree is burned instead of the dead body. This is when the corpse is never found. This is the reason why some people do not grow palash tree in gardens and plots.